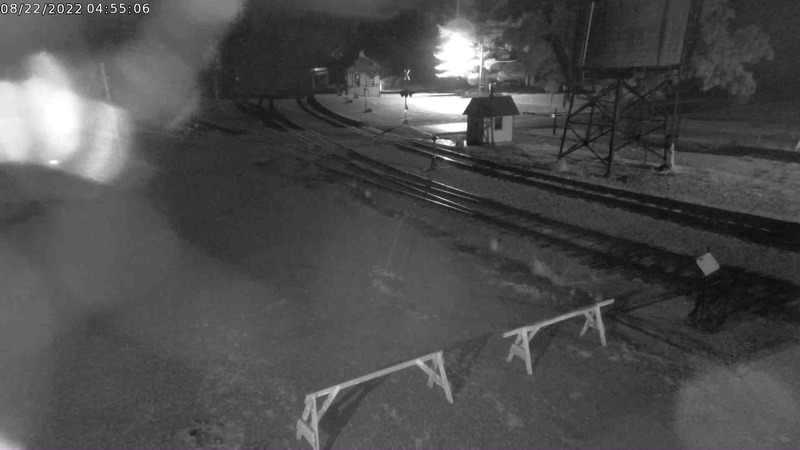 NOTICE: MLS&W #63’s $350,000 restoration is now complete. The car is now on display in the Coach Shed. 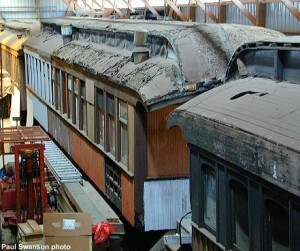 To read the extensive journal and related articles on #63’s restoration, click here. #63 on display, August 16, 2003. Bill Buhrmaster photo. #63, 9:30am, October 1, 2002. #63 after restoration, October 1, 2002. #63 before restoration, April 28, 2001. 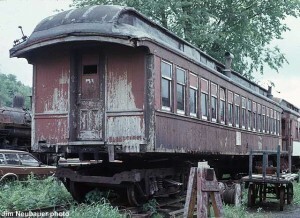 #63 awaiting restoration, April 2000. #63 being readied for transport, 1970. #63 as yard office in Chicago, 1970. #63 as C&NW #469, Eland Jct., WI, 1909. 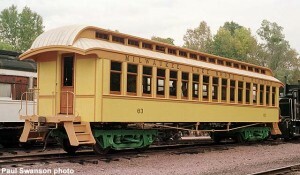 Coach #63 was built in 1888 by the Barney and Smith Co. for First Class service on the Milwaukee Lake Shore & Western Railway. The interior finish is varnished cherry wood and was designed by Edward Colonna. Colonna’s relationship with the Barney & Smith Car Co. ended soon after the design of these cars and he went on to greater fame in Canada. An unusual design feature of these cars is the Art Nouveau motif of the carvings above the doors and on the corner of the wash room. This is a departure from the Neo Classical motifs of other railroad interiors of the day. 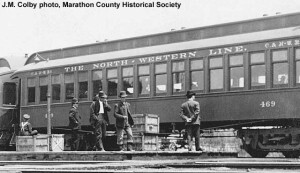 The Milwaukee Lake Shore & Western Railway served the northeast regions of the state of Wisconsin from 1872 to 1893. 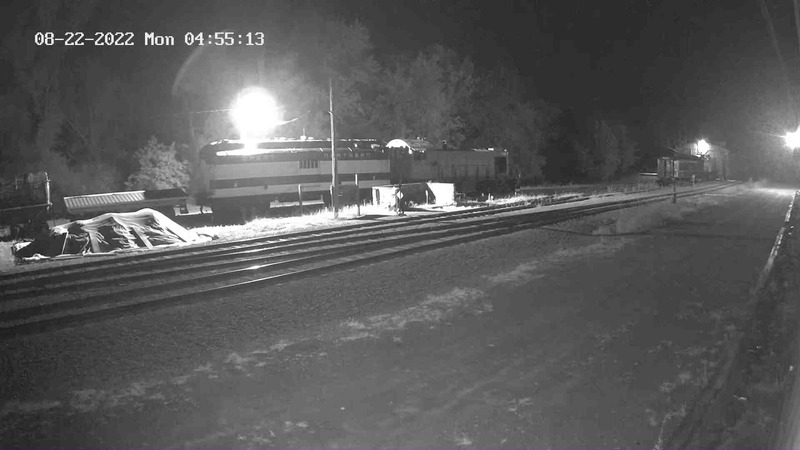 In September 1893, the railroad was acquired by the Chicago & North Western Railway. After the takeover of the Milwaukee Lake Shore & Western by C&NW, the #63 was renumbered #469. The car’s history from 1893 until 1909 is undocumented. From 1909 a “record of passenger equipment” data sheet from the C&NW does exist and the history is clearer on repairs but not car usage. 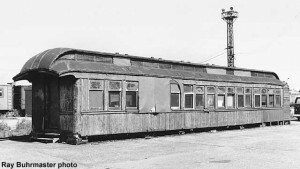 By 1930 the car was retired from revenue service and was placed on a foundation to become a yard office at C&NW’s Wood St. potato yard in Chicago. 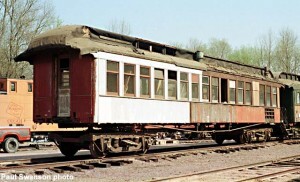 In 1970, the car was donated to Mid-Continent and museum personnel prepared the car for shipment to North Freedom for preservation and eventual restoration. Fortunately, enough of all the original interior has survived to make restoration to original appearance possible. 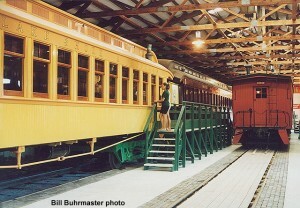 A successful two-year fund raising campaign was concluded on September 1, 2000 to raise $350,000 needed to restore the car to its original configuration. Work began in November 2000. Two and a half years later, the restoration is complete, and the car is now on display in the Coach Shed. The Barney and Smith Car Co. had its beginnings in Dayton Ohio in 1849. 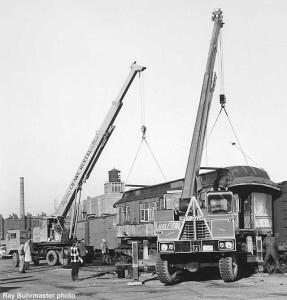 The company grew to be a major supplier of freight and passenger cars in the later half of the 19th century. The company produced many exquisite passenger cars in this time frame and records indicate that the prices were commensurate with the quality of the cars. The consolidations of many of the independent car builders and Barney & Smith’s inability to successfully convert to profitable steel car construction forced the closing of the works in 1922.